This is what he has to say about a very enjoyable day out not far from the air show site. “Yes” I said when the invite arrived. Last time BMW put on such an occasion was in Lechlade-on-Thames, deep in the Cotswolds, lovely country lanes to motor in but a two-hour drive, rather than 45 minutes back to Edgware. The Farnborough area I know well, and there is a good variety of roads, hardly as picturesque or narrow as those of Gloucestershire but representative. The BMW UK HQ is very much divided into two, BMW and MINI, with the press reception HQ for the day in the BMW building. The only really new car to see was the latest incarnation of the Mini convertible in the MINI building, virtually all new replacing not only its predecessor, the UK’s top selling soft-top, but also the Mini coupe which is now dropped. Tantalisingly the car will not be released onto the market until March and all we could do was look and see. One thing that is apparent is the way the roof has been dealt with. You can have it fully open, or just the front section. All electric of course. One detail not noticeable at a first look is the fabric for the outside of the top. It is a very discreet Union flag. The opening and closing is quiet but the proof of the pudding is how it performs on the open road, one assumes without rattles and little noise. You can even have an HUD (head-up-display). Prices start at £18,475. Available to drive were a selection of 7 series BMW to different specifications, two variants on the X1, and the superb i8. All the Minis were the longer wheelbase four-passenger-door models now about 40% of an 63,000 sales market in 2015. I managed the i8 of course, a 7 series, an X1, a Mini all-wheel drive Clubman, distinctive with a two-piece rear door and a Countryman with the traditional tailgate. The top of the range two-door BMW i8 looks and is a great car and coming in at £104,540 plus only £6,395 of extras is a true supercar at a (fairly) sensible price. It has gullwing doors, always a show stopper on arrival, and according to the manufacturer does 0-62 mph in just 4.4 seconds. Fuel consumption is put at 134 mpg and no road tax to pay. Not that it will matter one iota to its owner. 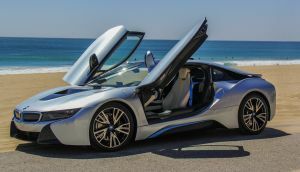 The BMW i8 is a combination of a 228bhp Mini engine driving the rear wheels and a 139bhp electric motor through the fronts giving the car stunning, instant acceleration and four-wheel drive traction. The driving experience is not really natural with a fake engine noise piped into the cabin through the speakers but it does feel quick. With Farnborough and its private jets nearby fortunately the Hampshire Police were not too watchful but it is the sort of car that stands out and cannot be taken just anywhere. As for the extras, the Protonic Blue/Frozen Grey colour scheme looked terrific (£450) but I am not sure about the leather engine cover (£1,075). One of the most interesting cars of the day was the X1. Don’t tell anyone but underneath it has the same platform as the new Mini Clubman. Work that one out. The versions I tried had just about everything available as an extra adding £9,305 to the list price of £37,500. Most are useful, except perhaps the bike rack preparation at £160 which I would leave off if my car..
With a 231bhp aluminium block diesel under the bonnet it does 62 in 6.6 seconds helped by an eight-speed auto box that shifts itself smoothly and can be overridden via paddles. The Navigation Plus package comes with GPS and a head-up display (HUD) which I predict will be a standard fit in most cars within 10 years. However good the central console is, and some are better than others, you still have to turn your head for a fraction to look at, say, a junction diagram. This can be seriously dangerous. Not only are you high up in the X1 but you only need to look ahead. BMW does not encourage journalists to come as twosomes on these occasions, which is a pity. Bring a second party along, tell them it is a day out enjoying wonderful cars, and once at the venue say that your job is to test out the back seat. In any event even lanky teenagers should find the rear acceptable in the X1, and behind lies a big, deep, double-floored boot. I wonder what Alec Issigonis would have made of the latest incarnation of his 1959 masterpiece, a true ‘people’s car’ with its wire for a door handle and sliding windows. While perfect for the school run it is also a practical real off the road product that would not have been out of place in last week’s BBC 2 romp by James May telling the story of the Willy Jeep and its successors. Or would it? It is what we now call a ‘Crossover’, fine for private tracks but perhaps not for the sort of terrain the former Top Gear one third ‘anchorman’ managed to find on BBC 2 last week (James May's Cars of the People). In any event this is the largest Mini variant and very much a medium-sized car disguised to pretend it is something it is not. In fact it is a very clever marketing ploy, a Mini on the inside from a driver’s point of view, but very much a family car, a sort of seamless growth without realising it. The Countryman is primarily assembled in Graz (Austria) under contract by Magna Steyr, making it the first of the BMW era Minis to be manufactured entirely outside the UK. For 2016 the five-door hatchback Countryman comes in all sorts of versions with MINI offering the all-wheel drive special edition version for the press day, no difference in handling perceived, the car clearly coming into its own when snow around or being asked to park in a grass car park. 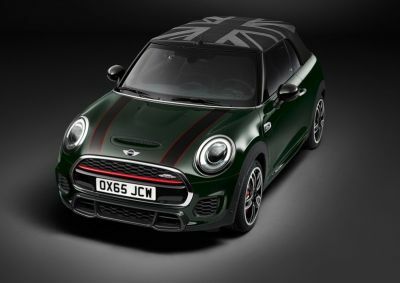 The basic price is £24,555 but the extras and delivery charges bring the total up to £30,340, making it the most expensive Mini yet. I mentioned the man behind the original Morris Minor as well as its even smaller successor and I think it only fair to give praise to John Cooper CBE, whose name lives on daily at Oxford where this new variant is the plant's first-four wheel drive product. John Cooper (1923-2000) was the son of Charles Cooper a garage proprietor from Surbiton, Surrey, who during the 1950s developed a series of lightweight rear engine single seat racing cars, culminating with the F1 world championship in 1959 with Jack Braham behind the wheel. In 1961 John started to market a modified version of the then BMC Mini, and as they say, the rest is history. To make sure it stays in the family BMW bought the brand in 2000. 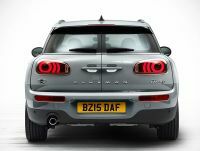 This latest Mini Cooper has six doors, the opening pair at the back and in truth questionable. The rear view is not that good but at least they have sorted out the styling and dropped the idea of three passenger doors and added a forth. The Cooper is powered by a smooth 2.0 litre diesel engine that makes it zip up to 62 mph in a very respectable 8.6 seconds and offers fuel consummation in the 65+ miles to the gallon range. The original Clubman was a fun machine. This latest incarnation is a great car with the wrong name. Why not resurrect the Mini Traveller nom de plume? The demonstrator came in at £29,605 but this includes £6,585 of extras. This latest version of BMW’s top of the range saloon car is a joy to drive and completely effortless with ‘toys’ galore. For such a large vehicle it is very nimble at home on the motorway, in traffic and country lanes. Some of the extras are a bit daft. OK it might give a better reception but is an independent rear telephone really necessary at £685 including VAT. The twin TVs in the back, plus a tablet computer, are great when being chauffeured but if the car is used at the weekends and you have three children you have purchased a problem. The basic car is £67,700 and the demonstrator had £21,795 worth of extras including what BMW call a ‘Gesture Control’. Perhaps this is a German way of putting two fingers up to Jaguar owners. Whilst BMW now includes Sat Nav in all its 5 and 7 series cars for free it also offers a larger screen version which will temp most customers. The greatest fun with the 7 series is not driving it at all but using the remote parking ability. With the hand control you can stand outside the car and let the electronics take over. Even better is the use of parallel parking but you have to be in the driver’s seat. With cars parked kerbside one just drives along until a gap is spotted, the device telling you that there is enough space. Then it parks itself. Next up for BMW will be the latest 5 series. And the elusive Mini convertible.